Comics Make Me Happy! : Comics Go Historical? It's funny how legitimate conversations can veer into the world of comics. This past week one of the history teachers at work brought up how there might be an error in the AP History textbook regarding Aaron Burr. While she was doing research online, her conversation consisted mostly of, "Did anyone know that [fill in random Aaron Burr fact here]?" about three times and me replying, "Yes, I did." I'm not really a history buff, but I was a little obsessive about the Federalist era there for a while. Let's just say that Alexander Hamilton was the Hal Jordan of his day, and that entertains me. Leave it to comics to make history more awesome than it already is. And thank you, Wikipedia. Are you as surprised as I am that Hal actually knew what year Aaron Burr died? How often to you see something historical in a comic book today? Comics today seem to exist in a cultural bubble: I'm not sure what world the characters live in. I know they live in the U.S., becuase pop culture references get dropped every now and then. Because I'm just one of those people that likes to learn random things, I kind of miss the "educational" value that comics had in the Silver Age. Even if they got the science wrong in a Flash comic, at least they were trying. And there were those little articles in between the stories that were somehow related to the stories: an article about astronomy in Mystery in Space, for example. I think reading a comic would be a little richer if some knowledge was added to the mix, and if those little informational columns came back, they could be an incentive to buy single issues, assuming they aren't printed in trades. Well, if you consider going on a power trip and prompting the aliens' western territories to secede from the Union, well, then sure, I guess he succeeded. While I don't need an overtly-historical story like this one to make me happy, I'd like a little mention of something I could use to win Jeopardy someday. Maybe the Flash rogues were the ones really responsible for stealing The Scream, for example? My favorite panel. Too bad this didn't happen in real life. In the sequel to this story, Hamilton shows up and is all awesome and finishes what the monster started. Okay, not really, but that would be cool. 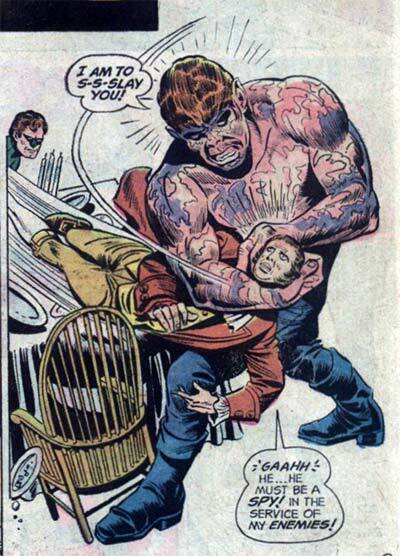 I know what you mean, I miss those ol' teaching-stuff-in-comics from the old ones! Not telling us what to do TO SAVE THE PLANET like PSA comics/Captain Planet, but these bit of historic lessons and such. That's too bad that European comics stopped printing the little trivia columns, too. :( I don't think the Johnny DC titles do it, either, but it would be great if they did. Thanks, Sea! Arrogant, womanizing, acting first and thinking later, an ego the size of the Brooklyn Bridge, and pitching the occasional hissy fit...Hal's definitely related to the first Secretary of the Treasury. Oh God, I never realized it, but you are dead on, with your Hamilton/Jordan comparison. I...I'll never be able to look at Alexander in the same way again! Not that Burr was a prize peach either. 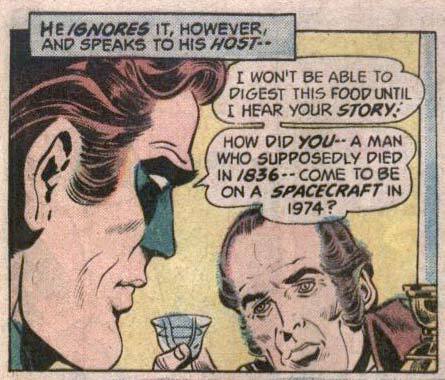 And of course Hal didn't know what year he died...but I'll bet the ring did. Heck, there are times when I wonder if Hal even knows who is currently the president. It was in a Silver Age Atom story that I learned who the Mohocks were!